Japan ushers in the New Year with osechi ryori—a set of various traditional dishes, each representing a desired outcome for the year ahead. 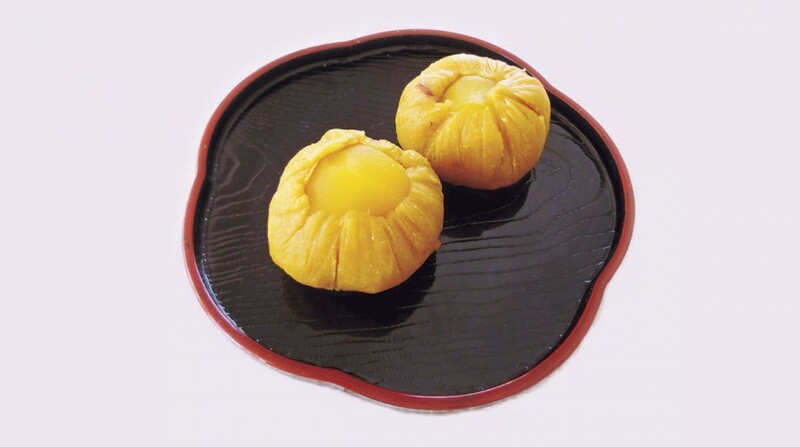 If you’re looking for an increase in your bank account, try attracting fortune with kuri kinton—a sweet-potato-and-chestnut dessert whose bright shade of yellow symbolizes fortune, or gold. Rinse sweet potato with skin intact. With plastic wrap, wrap without wiping the moisture off. Microwave on medium to high (600-800W) for 5 minutes or until cooked tender. Peel skin off sweet potato. With a masher or fork, mash. Add butter, sugar, salt and rum or cinnamon, if desired. Keep mixing. If too soft, add dried okara. Start with 1 tsp; gradually add to mixture until consistency is just right. On plastic wrap, spread 1/6 of mixture. Make into a small, flat, round shape and place drained chestnut in the middle. Fold plastic wrap so the potato covers the chestnut‘s bottom and sides. Squeeze the top to form a shape called chakin shibori. Note: If you find the sweet potato to be sweet enough, you can skip the sugar. Also, be careful when peeling, as the sweet potato can be very hot.